This short speech given by Dr. Gil Hedley, Ph.D (and really animated guy), discusses the accumulation of fascial fibrosis, or ‘fuzz’, which accumulates both within, and between fascial planes as a result of injury, lack of movement, postural patterns….or simply time. 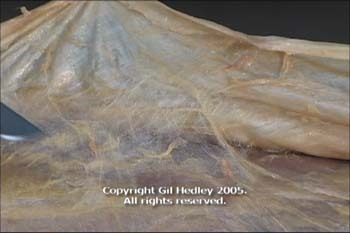 I have written many posts regarding the importance of targeting fascia first and foremost with our soft tissue treatments….specifically the importance of maintaining sliding between fascial planes – be it between fascia superficialis and fascia profunda, or within the layers of profunda fascia which envelop contractile tissue (I refer you to the these previous posts on fascia and fascial planes). Lack of adequate fascial plane sliding can lead to pain symptoms, aberrant biomechanics of movement, as well as decreased force production and transmission.